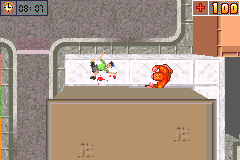 So, continuing this week's theme, I looked up games where you play as a monster, and found this absurd GTA clone made for the Gameboy advance. 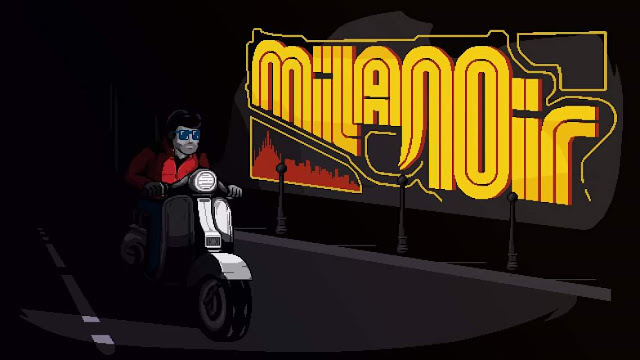 It's an overhead open world game in the style of the original Grand Theft Auto. 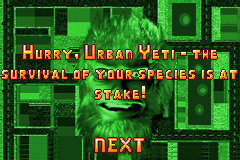 You control a yeti in a large city where everyone is out to get you. 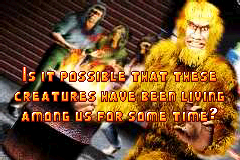 We're treated to a brief introduction wherein it is speculated that large ape-men have been living among us, and possibly just want to be left alone to pursue the comforts of a family. However, as mentioned above, the entire world loses its cool when you decide to venture out of the invisible world of homeless people gathered around garbage can fires in the city, probably because the homeless were tired of being ignored when raving about the 7 foot beast living amongst them went ignored for so long. So, after our brief story introduction, we are dropped into the world with little direction as to what to do. Moments after you begin your aimless journey and become acquainted with the controls, we hear a digitized scream, and up pops what will be our method of story delivery- the above image of our face plastered across an ugly background. The print out tells us that we have heard the scream of a female yeti, and that we must get to her before another yeti gets her first. The survival of our species depends on it, apparently. More on that below. Collision detection in the game is hit or miss. Sometimes a car will hit you full speed, and you will be little more than a heavy obstacle obstructing it's path, and it will push you as it tries to go forward. Other times, it will send you flying into the air. People are so gung ho on beating you up, that they'll run right past you directly into a wall, killing themselves in the process. When they do manage to hit you, however, they take you down pm health very quickly. They also seem to be able to hit you when they're anywhere within a few feet of you, but have poxel perfect hit zones themselves. 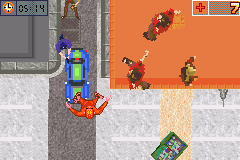 Now, to help.try to alleviate this disparagement between ease of being hit and the ability to fight off an attacker, the game conveniently places fruit stands around the city that you can punch to make hot dogs jump out of. Eating those hot dogs will restore health. Inconveniently, they each restore 4 health. Most inconvenient, sometimes each punch sends another event flying out of it, each of which will damage you on the way out. 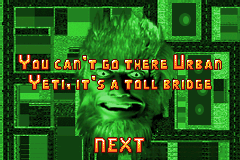 After wandering around the map running into obstacles that are hard to discern from overhead objects that you can pass beneath, and trying at all costs to avoid citizens throwing punches, cops firing guns at you, and cars trying to run you over, you follow the arrow to your intended beloved and are met with this message- it's a toll bridge, and you need to earn enough money to pay the fee. Your next objective is to now find a newspaper and get a job. A job, no less, that involves working in a soup kitchen feeding your former homeless brethren. Still bitter about your existence being denied, they punch you if you bring them the wrong food, or don't get them food in time. 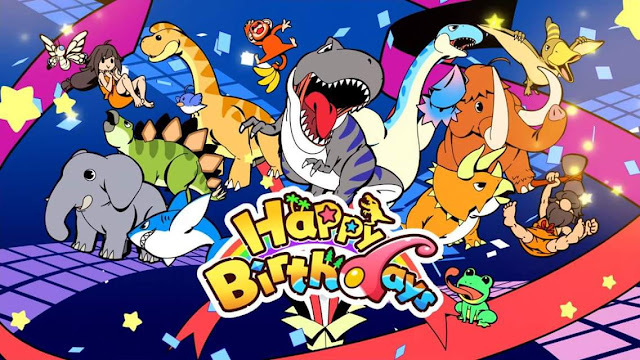 It is the most brutal, early incarnation of Diner Dash ever. Upon death, the game will treat you to a yeti cam, which will show all of the chaos that ensues immediately after your death. 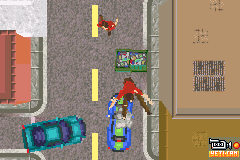 This includes cars running into each other, citizens jumping off of buildings to land on your corpse, and possibly police officers firing at your general direction. The entire game is an exercise in the absurd, and if it weren't for all of it's shortcomings, it could easily be a cult hit. 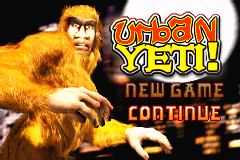 Those shortcomings do exist, though, and Urban Yeti comes off as little more than a strange and obscure GTA clone on a console that necessitated experienced programmers with extensive knowledge of the console they were programming for to pull off a good- great game that you wouldn't expect to see on such limited hardware. Come back tomorrow for another game where you play as the monster.